Professional, modern and technially high-quality, 14-channel remote control system for universal use in many RC vehicles and vessels. 14 channels can be controlled independently by means of 2 control sticks and 10 switches(5x pushbutton/5 step swith), for example light/sound, horn, winch, support legs, water pump and water monitor. 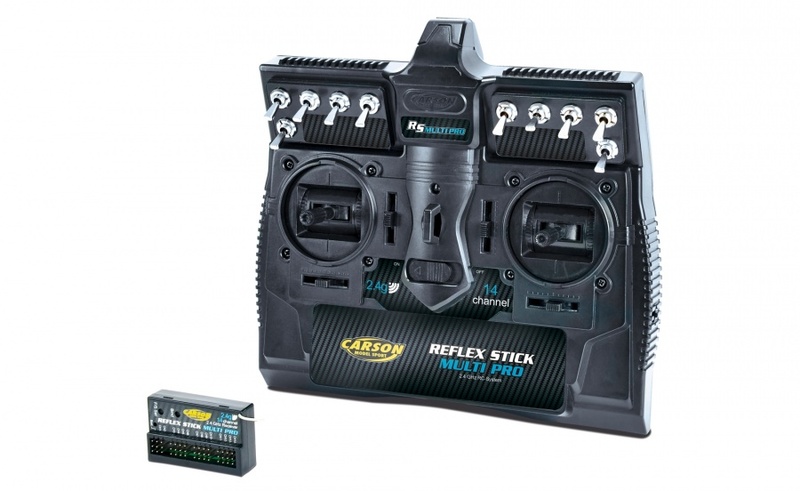 The Reflex Stick Multi Pro 14 channel system is fully compatible with the MFC 01/03 and DMD units from Tamiya. Carson har mye til Tamiya Lastebiler.